Search for all "HPRT1 / HPRT"
Mouse anti Human HPRT1 / HPRT OTI1H2. 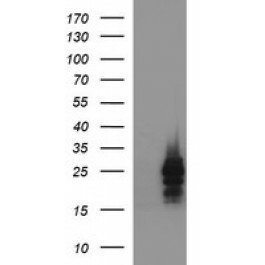 Full length human recombinant protein of human HPRT1(NP_000185) produced in HEK293T cell. The protein encoded by this gene is a transferase, which catalyzes conversion of hypoxanthine to inosine monophosphate and guanine to guanosine monophosphate via transfer of the 5-phosphoribosyl group from 5-phosphoribosyl 1-pyrophosphate. This enzyme plays a central role in the generation of purine nucleotides through the purine salvage pathway. Mutations in this gene result in Lesch-Nyhan syndrome or gout. [provided by RefSeq, Jun 2009].